SKREEONK.com HAS YOUR FIRST LOOK AT THE NEW TOHO GODZILLA and CONFIRMS THE WRITER/DIRECTOR AND SFX DIRECTOR! – SKREEONK! SKREEONK.com HAS YOUR FIRST LOOK AT THE NEW TOHO GODZILLA and CONFIRMS THE WRITER/DIRECTOR AND SFX DIRECTOR! 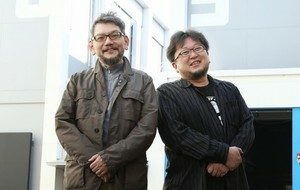 Anno (left in photo) received the offer to work on the film at the end of January 2013. Mentally exhausted after 2012’s Evangelion: 3.0 You Can (Not) Redo , he declined the offer once. However, TOHO ‘s earnestness and Higuchi’s enthusiasm eventually won him over, and he agreed to work on the project. Anno is working on Studio Khara ‘s fourth and final new Evangelion film, and the new TOHO Godzilla film is limited in budget and production time compared to Hollywood. However, Anno said that he has pride in the new Godzilla project as a film, and is making both that film and the new Evangelion film with all his effort. 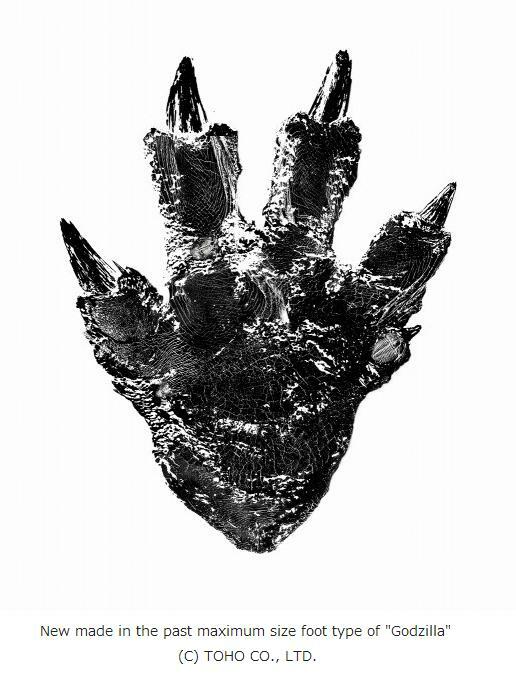 TOHO unveiled an image (pictured above right) of the foot of its new Godzilla on Wednesday. According to Cinema Today, the foot is indicative of the new Godzilla being the tallest one yet, towering over the 108-meter-tall (about 355-foot-tall) incarnation in Gareth Edwards and Legendary Pictures’ 2014 Hollywood film. The setting of TOHO ‘s new Godzilla flm is Japan. Holy Hell of a Happy Tuesday – fandom! Check out this Kaiju-sized news! An article from the Japanese site Oricon (as well as EIGA.com and several other trusted Japanese sources) confirms Anno Hideaki as our writer/supervising director for Toho’s new Godzilla film in 2016, as well as giving us our first, official TOHO licensed look at their new Godzilla – his footprint! Not only that, but we now know that the amazing Tokusatsu director of the Heisei Gamera films, Shinji Higuchi, will be in charge of the action and SFX as an accompanying director! These two life-long friends and champions of the Kaiju genre will be tackling the direction of Toho’s unnamed 2016 sequel together. Can you say dream team? Lawd’A’Mercy! How cool is that!? We’ve got a very mutated-saurian-esque foot here, complete with toes reminiscent of the 1954 suit (plus a little “mutant” dangler of a toe – nice touch). The overall texture of this photo combined with the classic design of the foot (unlike the sauropod stubs we got in Legendary’s design) are both wonderful signs of things to come. And is it just me, or does everyone else want this as a poster, too? We went ahead and made a killer mock-poster for everyone to enjoy, which you can view on our TOHO’s 2016 GODZILLA page HERE. Either way, I can easily see a Yuji Sakai MireGoji-esque Godzilla being attached to this foot. Only time will tell! 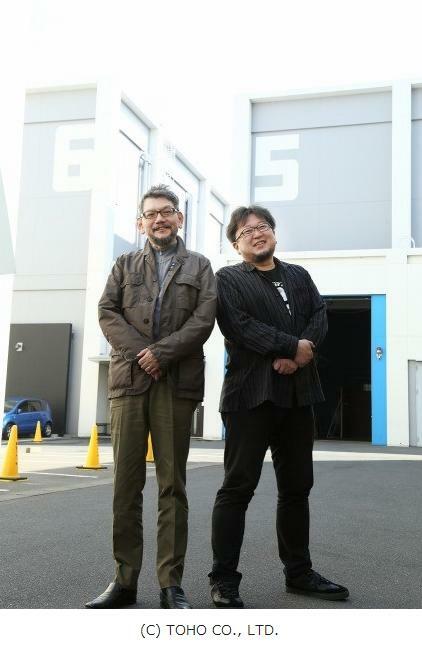 The original article tells us many things, most importantly it confirms that Anno Hideaki of EVANGELION fame is our writer and supervising director! Hideaki’s body of work as both a screenwriter and director includes several well-received EVANGELION films, the excellent live-action Cutie Honey film and many other Japanese Sci-Fi and Anime epics. You can find out more about his filmography HERE. And if that wasn’t enough – legendary Tokusatsu effects wizard Shinji Higuchi is our action director and will be in charge of the special effects! For those of you unfamiliar, Higuchi is the man responsible for the best Tokusatsu effects of modern day Kaiju films – Kaneko’s Heisei Gamera Trilogy! He got his start all the way back in the early 1980’s working on Return of Godzilla as an effects assistant, and even directed an SFX scene for Kaneko’s other Kaiju film and fan favorite GMK. This is, to put it lightly – a monumentally fantastic piece of news! If you have not seen the Heisei Gamera trilogy – stop what you are doing now and buy the dirt cheap Blu-Ray set. It will change your life! Exciting news – exciting day! What are YOU looking forward to most in the new film? Let us know on our Facebook page – and be sure to LIKE US and keep tuned to Skreeonk.com for all the latest news! There’s a Trilobite on that foot!! Yeah your right, nice touch. Everything here all looks and sounds very promising. Next Post G-TUBE: Fresh Vinyl Live is Back with an X-PLUS ONSLAUGHT! Previous Post Test Your Kaiju Knowledge With Official Skreeonk.com Trivia Quizzes!